After the trade deadline that passed this Monday, the Anaheim Ducks took it upon themselves to improve their lot and get ready for the playoffs. Now they have a little more offensive on their roster, it’s starting to look like the Ducks are finally in position to catch the Pacific Division leader. That was unthinkable only a few months ago with their bad season start and offensive drought. So hopefully, they think the drought is over and that a ninth consecutive victory Wednesday night should get them back in position. An added bonus is that recently acquired forward Jamie McGinn is expected to take the ice against the visiting Montreal Canadiens later tonight when they play host to the slumping Habs. Anaheim is riding a 10-game point streak in the middle of a 17-2-1 stretch. Anaheim has a 34-19-8 record, moving to within two points of first-place Los Angeles after Sunday’s 4-2 home win over the very same Kings. “We’re near the top of the mountain, but we’re not at the top of the mountain yet, so we have to keep persevering,” said coach Bruce Boudreau, whose team has won 22 of 28 since Christmas. He couldn’t have asked for more. Basically, the Ducks have been on their longest winning and point streaks since an 11-0-2 run in 2013-14. That run included a franchise-record 10 consecutive victories. That season also is the last time they won eight straight at home. But that could change because tonight something they could accomplish Wednesday night along with eating away at the Pacific lead, despite Los Angeles holding the tiebreaker. Anaheim has been averaging a league-high 3.8 goals in 20 games since Jan. 13. 13 of their 29 goals came on the power play. Their team has only gotten deeper with Monday’s acquisitions of James McGinn and forward Brandon Pirri. Pirri, came over from the Florida Panthers in exchange for a sixth-round pick this year. But he could miss two weeks with an ankle injury. Luckily McGinn should be ready after being acquired from the Buffalo Sabres for a conditional third-round selection. McGinn has 27 points in 63 games. That’s a good number since out of all the Ducks, only Perry (26) and Rickard Rakell (16) have more goals than his 14. The Ducks didn’t have to trade the soon-to-be restricted free agent, goalie Frederik Andersen, who is 10-0-2 with a 1.81 goals-against average as a starter in 2016. 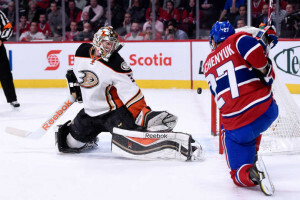 Backup John Gibson, made 27 saves on Sunday, has won three in a row and stopped 37 shots in a 3-1 home win over Montreal on March 4 last year, when these teams last met. He might get the call again tonight. Anaheim is 3-0-2 in its last five home games against the Canadiens who have a deceiving 30-28-5 record. As of right now, they have the fourth-fewest points in the Eastern Conference and were major sellers prior to the trade deadline. They traded veteran forwards Dale Weise and Tomas Fleischmann to the Chicago Blackhawks last week, and Montreal also sent ex-Duck Devante Smith-Pelly to the New Jersey Devils on Monday. “I’d say that for (rest of the season), our primary objectives are experience and evaluation,” general manager Marc Bergevin told local media. Montreal has had an insignificant four-game point streak which ended on Monday in a 6-2 loss in San Jose. West coast trips usually don’t bode well for Canadian teams from the East, just ask the Toronto Maple Leafs! The Canadiens have been on a brutal slide since late December when their all-star and MVP goaltender, Cary Price went down with a serious injury. They simply are out of playoff contention after their scoring also dried up. Within reported in-fighting between the coach and star defenseman P.K. Subban, it’s likely they won’t have much fire power or focus against the soaring Ducks tonight.